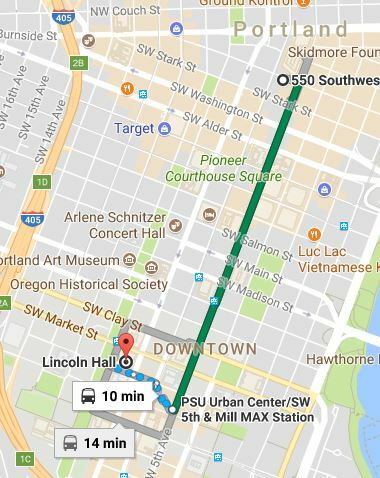 Getting between the hotel and Portland State can be found further down the page. The Portland Union Station is located 0.5 miles north of the hotel. The Greyhound Bus Depot is located 0.5 miles north of the hotel. The Bolt Bus, which offers transportation from Eugene OR to Vancouver BC, drops off downtown Portland, a few blocks from our conference hotel. The hotel offers limited valet parking only, $30 USD daily/overnight for NATS guests (regular $40), with unlimited in-and-out privileges, 24 hours a day. No self-parking available at hotel. Self-parking garages nearby. Transportation and Accessibility for Oct. 27th Presentations and NATSAA, and Oct. 28th NATSAA. Sample itinerary from Google Maps. The MAX train from the hotel to the school is a good option. There are also buses and taxis. Walking is an excellent choice if the weather allows. The distance is 0.8 miles, all on city sidewalks. Driving: The closest parking lot to PSU Lincoln Hall (evening only after 5pm) is Parking Structure 2: 1724 SW Broadway. $5 evenings after 5pm, $7 Saturday. Note your license plate number and pay at the pay station. Additional parking information is available on this PSU website. Parking at the hotel is $30/night. MAX trains have ramps that extend onto the sidewalk for easy boarding. The accessibility entrance to Lincoln Hall is from Broadway Street. There is a ramp from that doorway entry. Individuals would go straight from the ramp to the end of the hall, then turn left (the only option). The main entry doors to the Recital Hall will be half-way down. Restrooms are to the right of the right entry door to Lincoln Recital Hall and have wheelchair access. Seating in the Recital hall: We have 5 easily movable chairs for wheel chair access at the top row of the recital hall.